Each print is hand numbered, accompanied by a certificate signed by the Master Printer and is numbered to match the print. The editions are unlimited. 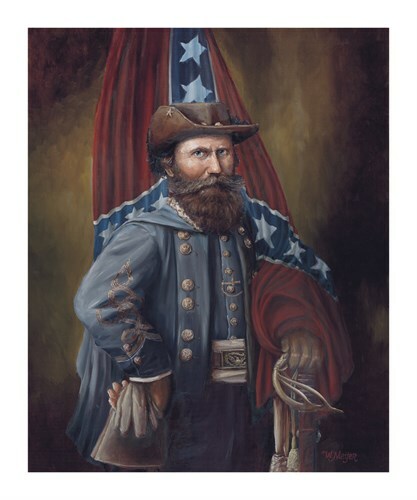 The Confederate Brigadier General James Ewell Brown ‘JEB’ Stuart was the embodiment of reckless courage and flamboyancy and a popular hero. Just before the ‘Seven Days' Battle’ in June 1862 in defence of Richmond, Stuart was sent by Confederate General Robert E. Lee to locate the right flank of the Federal army under General George B. McClellan. He not only successfully achieved his mission, but also rode completely around McClellan's army to deliver his report to Lee. On the 15th of October 1862, two days after the successful Chambersburg Raid, Stuart received a pair of golden spurs, bought by a woman living in Baltimore and smuggled to the general. Stuart was delighted and from this time he signed some of his personal letters with a sobriquet he fashioned for himself: ‘The Knight of the Golden Spurs’.Meijer depicts Stuart wearing his double-breasted shell jacket with federal staff officers’ buttons. His yellow silk general's sash is encircled by a Model 1851 Federal Sabre belt with plate. His left hand, in buckskin gauntlet, rests on his model 1860 cavalry sabre of French make. William Meijer is “a modern-day storyteller on a voyage beyond horizons of space and time”. Born in the renowned Dutch city of Arnhem in 1962, in the lands of the great Dutch and Flemish masters of the 16th and 17th century, William Meijer discovered his ability to draw and paint at an early age. After his education, Meijer joined the Royal Netherlands Navy, where he rose to the rank of Commander. In the early 1990s he began to pursue a career as an artist and he has since exhibited his paintings throughout the Netherlands and received many private commissions. A self-taught artist, Meijer’s studies of the Great Masters’ painting techniques is evident in much of his work; he has created a distinctive style, which unites tradition and modern realities. He is dedicated to recreating powerful historical figures with emotion, painting them as they would appear in front of his easel, if he could bridge the gap in time. Meticulous historical research into personality, physical appearance, uniform and accoutrements is combined with contemporary colour, light and composition to recreate the sitter in his or her very essence. Therefore, it is often months between initial concept and when the first brush, loaded with paint, touches the canvas. Without question, Meijer’s background in the Royal Netherlands Navy has influenced his artistic career and he has used his vast naval knowledge to illustrate commemorative books and design a coat of arms for the Royal Netherlands Defence College. A recent portrait of Vice Admiral Lord Nelson KB was accepted by the Royal Navy to play a prominent part in the Trafalgar 200 festivities. This Gouttelette print on paper is published with light-fast inks to BS1006 Standard onto acid-free calcium carbonate buffered stock, mould-made from 100% cotton and sourced from environmentally conscious paper suppliers. This product is exclusive to Rosenstiels.